My husband loves nothing more for breakfast than french toast. 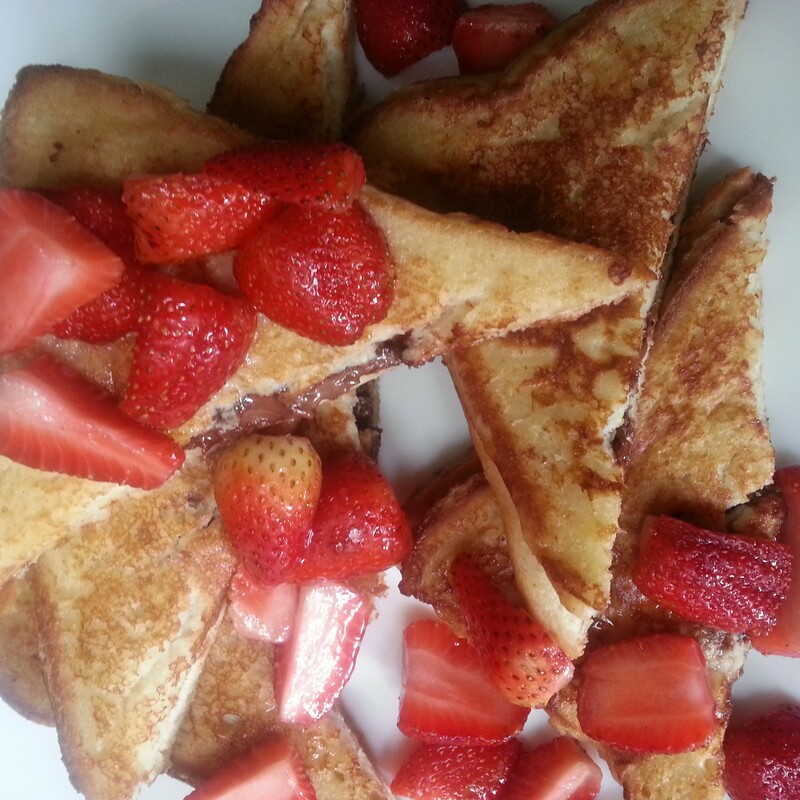 My younger daughter has taste buds just like him, though is not really fond of french toasts. She takes hours to order, likes fancy food and Nutella!! 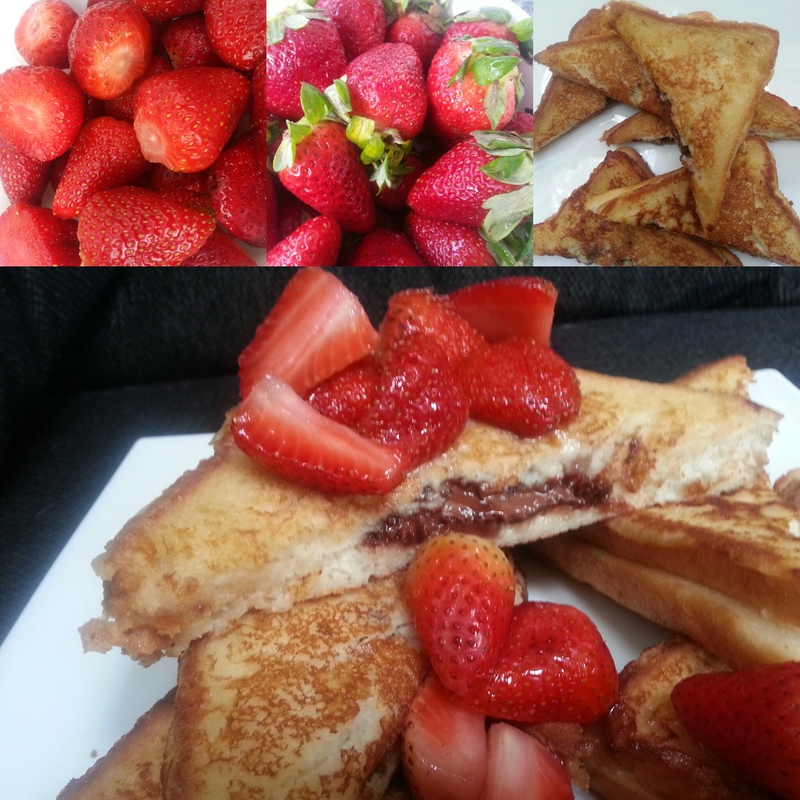 To mix these two to make a perfect breakfast I didn’t have to go far- Warm runny Nutella inside fluffy and golden french toast with sweet macerated strawberries. It was what I had imagined it would be; an irresistible flavour of Nutella and strawberries (I mean who will not love Nutella and Strawberries?) A perfect and indulgent breakfast. My hubby and kids loved it! Slice the bread using a serrated knife into 1 1/4-inch slices. Cut through the center of each slice keeping the ends attached. Put a tablespoon of nutella in the center of each slice and keep aside. Whisk together the eggs,milk,cream,vanilla,caster sugar, flour,baking powder and cinnamon until well combined.Pour into a shallow dish.Heat the butter in a non-stick frying pan over a medium flame.Dip each side of the bread into the batter for a few seconds pressing very lightly to help the bread absorb the liquid. Cook over a moderate flame for about two minutes or until golden,then carefully flip and brown the other side. Serve hot from the pan dusted with icing sugar and topped with macerated strawberries.